Moon makes use of cityscapes, landscapes, and still images to paint a unique picture of a band at work. Vincent Moon's film about The National begins with black and white snippets of the band performing live, accompanied by a slow-building droning sound, setting the stage for an unconventional portrait of a band at work. Ostensibly, Moon's film focuses on the band making their fifth, and what would go on to be their most successful, album, The Boxer, yet there is much more at work here than a typical music documentary. In fact, it may even be misleading to call A Skin, A Night a documentary, as it rejects many of the standard techniques many would expect from such a project. In a similar way to A.J. Schnack's Kurt Cobain: About a Son, Moon makes use of cityscapes, landscapes, and still images to paint a unique picture of a band at work, as well as offer a more complete picture of the band. Following the opening snippets of the band onstage, the first interview shows lyricist and singer, Matt Berninger, talking about how difficult it is to be a normal person when thrust into the spotlight. He emphasizes the awkwardness and insecurity that is impossible to escape when one is at the center of largely unwanted attention. What follows is a cursory attempt to provide some context for the making of The Boxer, with a brief history of the band's early days and previous recording processes. This short introduction to the band is meant to serve as a contrast to their approach in recording this most current album. There is particular emphasis given to the collaborative nature in the recording of The Boxer, one that makes for a much more rewarding experience. One of the interviews with brothers Bryce and Aaron Dessner focuses on the closeness of their working relationship. This offers a nice contrast to an earlier assertion about the different personalities at work and in turn, the creatively challenging experience that working together invokes. Moon's approach is one with very little narrative or linear structure. Nothing is presented in a straight-forward manner, offering the viewer smaller, yet at times more meaningful, glimpses into a band at work, piecing together new songs and collaborating in the studio. In fact, the only real concession to any kind of structure involves the loosely divided sections according to different members of the band, although each of the two sets of brothers -- Bryce and Aaron Dessner and Scott and Bryan Devendorf -- are lumped together in their own sections, rather than having individual emphases. One of the more interesting choices made is the almost complete absence of talking head interviews. Instead, Moon relies on interview snippets over pieces of the songs in progress. While creating a fluid, open atmosphere, this absence of traditional interviews makes it unclear much of the time just who is actually speaking. Although potentially alienating to casual fans, Moon's approach works in its ability to capture some very nice and obviously personal scenes. One of the most beautifully intimate moments in the whole film takes place as Berninger is in the studio working out the lyrics to “Green Gloves” -- the camera is particularly unobtrusive and thus, what it captures is very powerful. Moon seems to be attempting a visual interpretation of not only some of the recurring themes mentioned by the band (tension, isolation, and collaboration), but also of the songs themselves. While this approach is mostly successful, there are moments throughout the production that the stylistic choices obscure some of the insights offered by various band members and at times, this tends to be somewhat distracting. For instance, there are several interview portions that are barely audible over the music being played alongside the conversation, leaving the viewer struggling to hear what was just said. Oftentimes, the songs are cut off just before they really get going, another unconventional choice that leaves the viewer wanting more, and it can be frustrating. Clocking in at just over one hour, Vincent Moon's A Skin, A Night is an unusual attempt to capture the spirit of a band at work. 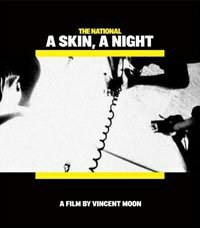 Bypassing many music documentary conventions to instead provide the viewer with glimpses of The National and their music, Moon has successfully filmed the ephemeral moments that are rarely seen, without losing the transient quality that makes them so effective. What must also be noted is that the film often sacrifices context and narrative in order to achieve these moments. There are no traditional extras for the film, no featurettes or deleted footage. However, the DVD comes packaged with a bonus EP of demos, unreleased tracks, and live versions of songs from the Boxer recording sessions. Titled The Virginia EP, the disc offers further insight into the making of the album and the band's recording process.